(Sentinel Photo By Allen Hamil) Above, Kingsley-Pierson’s Madison Goodwin takes a steal for an easy layup in the opening moments of Friday’s win over MVAOCOU. Goodwin finished with 19 points to lead the Panthers. KINGSLEY — The Class 1A No. 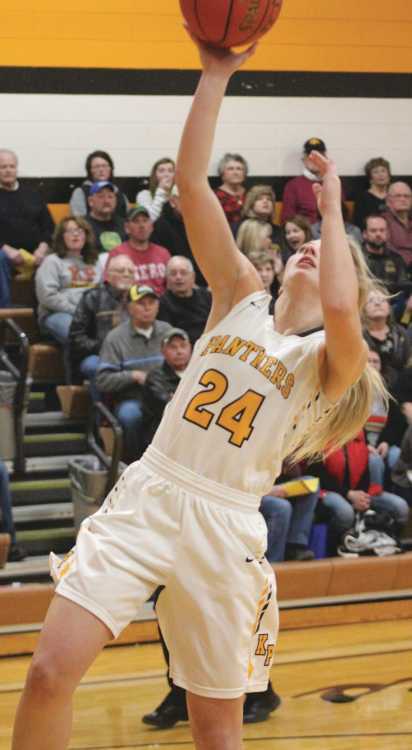 13 Kingsley-Pierson girls basketball team came out with an aggressive nature to start 2019 as they scored 31 of the first 33 points in the game en route to a 73-31 win over Western Valley Conference foe MVAOCOU on Friday. Head Coach Nicole Goodwin liked the energy she saw from her team in their first game out of the break. Madison Goodwin picked up a steal and took it back for a layup to get the game started and the Panthers didn’t let up until they had built up a sizable lead. Madison, the lone senior on the team, said they were looking to set the tone early with their pressure. The defensive intensity forced MVAOCOU Head Coach Derek Dougherty to use two timeouts in the opening two and a half minutes of the game as the Rams found themselves in a quick 12-0 hole. Katelyn Trucke got the Rams on the scoreboard shortly after the second timeout, but the team went scoreless the rest of the first quarter as the Panthers led 29-2 after the first eight minutes as Delaney Iseminger sank a 3-pointer with about 15 seconds left in the frame to cap off the scoring. The final five minutes of the first quarter included all but two points of a 19-0 K-P run which extended into the second quarter. Anna Heck ended ended a drought of about six minutes for the Rams with a 3-pointer which was promptly answered on the other end by Abbi Bailey. From there, the Panthers saw their scoring pace rapidly fall off as they added just five more points in the remaining 6:25 of the first half with free throws from Madison Goodwin and Jayde Barto coming late in the half to end a dry patch for the Panthers. The pair finished with 19 and 18 points, respectively, as both also had seven rebounds. Goodwin added five assists, four steals and a block while Barto had three assists and the same number of steals. The Panthers continued to build on their lead in the second half with a pair of Bailey free throws putting the team at the 35-point running clock margin with 2:02 left in the third quarter. She followed up with a layup plus the free throw on the foul as she reached 10 points in the game while adding five boards and four steals. McKenzie Goodwin led the team off the bench with eight points and a team-high 11 rebounds. Despite losing six seniors from last year’s team who contributed about two-thirds of the team’s scoring, the Panthers actually have a better record through 11 games than last year’s team which fell just an overtime short of their third straight state tournament. Madison Goodwin said all of the different pieces have come together so far this season. Kingsley-Pierson improves to 10-1 on the season and will take a six game winning streak into Tuesday’s matchup with Lawton-Bronson. The Panthers won the first meeting of the season by scoring a season-high in an 89-63 game.